Hanoi is not a small city. With a population peaking well over nine million, where almost every single person drives a motorbike, walking around Hanoi felt like walking through a swarm of bees without getting stung. Even walking on the sidewalk wouldn't save us. Here, there are no rules of the road— bikes drive and park on sidewalks, cars weave from lane to lane, and no one seems to stop or even slow down when they drive through an intersection. The organized chaos (oxymoron!) seems to work, though, and despite the pangs of a growing city, Hanoi is a wonderful, eclectic mix of new and old, of culture and history, of West and East. To me, the life blood of Hanoi is in the streets. Avoid the fancy restaurants and hotels. Pop a squat on a plastic stool and tuck into some delicious street food and people watching. When we first stepped out into the street and looked, we saw French. Colorful buildings. Balconies with hanging green plants. Antique windows and columns. Bakeries sprinkled around the city, making real baguette bread. Cafés on nearly every street corner, selling some of the most delicious coffee in the world. Then, we brought our eyes to the ground, and we were reminded we were still in Asia. Plastic bags stuffed in rusted gutters. Rats scurrying over brick walls. Disastrous driving. Women washing their clothes, their meat, their babies— anything and everything— in a bin on the street. Men smoking tobacco out of bamboo water pipes while playing a game of card games on small, plastic stools. Groups of friends ordering big bowls of noodles and slurping them down in the street, on the same, small plastic stools. Hanoi happens in the streets. It's raw, it's real, it's interesting. It's just the way it is. We spent the beginning and the tail end of our trip in Hanoi. Like most major cities, there was much to see and many new foods to try. Here were our tops— our top three sites and our top three dishes. All of the streets in Hanoi have character, but this one surely makes the top of the list. Tucked away in the Old Quarter lies the "Train Street"— a tiny, zig-zagged road with train tracks built right down the middle. Trains speed by at various points of the day and evening, but that doesn't seem to bother the people who live and work there. 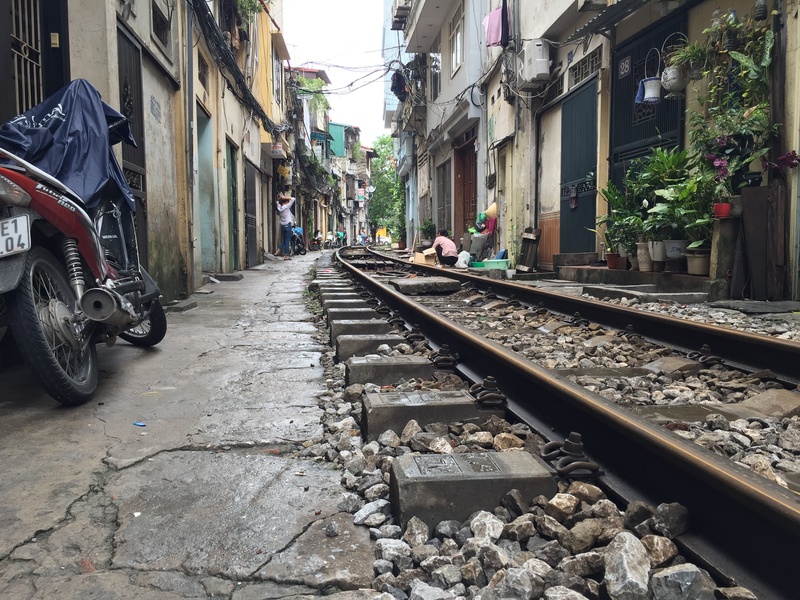 Like everywhere in Hanoi, life happens on the streets... or, in this case, the railroad tracks. We ventured to the Train Street one afternoon, marveling at how close people lived, worked, and played near the tracks. We spent awhile exploring them and peaking inside the open houses along the way. Eventually we came across "Hanoi's Train Street Café" and stopped in for a coffee. Luckily, we walked in at the perfect time— we were just 10 minutes away from the afternoon train. We sat on the tiny stools in the even tinier café, anxiously awaiting the train to pass through. Once we heard the loud horns ring, we popped outside to get a closer look. This experience was one of the most eye-opening, but also one of the most heartbreaking. This prison is located in the center of Hanoi, and is a must-visit for anyone interested in history and culture. The Hoa Lo Prison, which translates to "fiery furnace" in Vietnamese, was originally built by the French in 1886 to house Vietnamese political prisoners. Over the course of the French occupation, the prison held over 2,000 prisoners in horrendous conditions. Prisoners were chained to walls, kept in enclosed, dark spaces, and starved. If they didn't die from disease, they likely died from torture or were sentenced to the guillotine. Some prisoners even tried to escape through the sewers... some were successful, some were not. When the French were ousted from Vietnam in the early 1950's, the Vietnamese took over the prison. They designated a section of the prison for American POW's during the Vietnam War. This section of the museum is small, as it was only used for a short time. Senator John McCain was the most well-known prisoner here. His flight suit and parachute are on display. Even today, it's still a bit unclear what conditions were like there during this time. American POW's report torture and abuse, while the museum boasts photos and accounts of how well the Vietnamese treated the prisoners. After the Vietnam War, the POW's were slowly released. The prison continued to hold political rebels for 20 years, but it eventually was shut down to make way for the growing city. 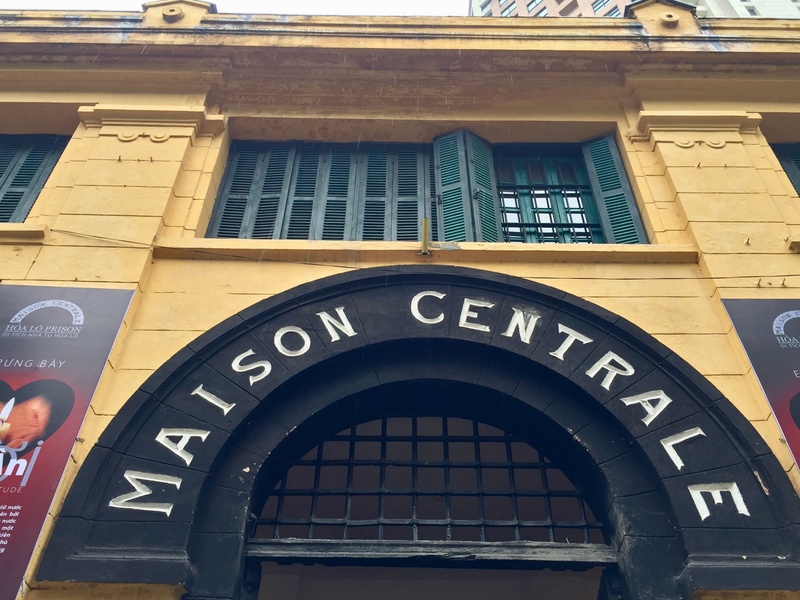 Walking through the dark, windowless cells and reading accounts from prisoners' lives in Hoa Lo was absolutely horrifying and heart-wrenching. From walking through the dark, musty cells, to reading the diary entries of the tortured prisoners, there's no doubt you will leave this place teary-eyed, but with deeper sense of understanding. 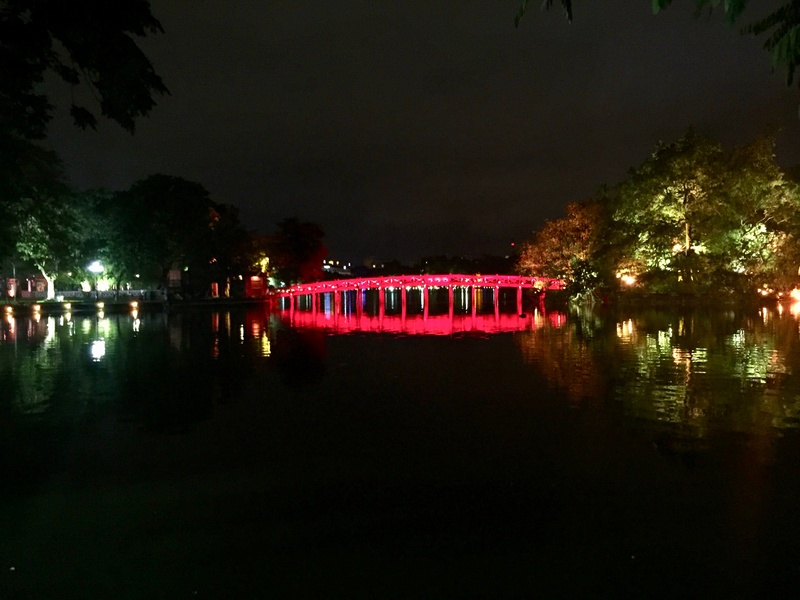 These are two beautiful lakes in Hanoi that are well worth the visit, if only to escape the chaos of the city for an hour or two. Hoàn Kiếm Lake (pictured above) is walking distance from the Old Quarter in Hanoi. It's best to visit on the weekends because the streets around the lake shut down, so you won't be bothered by any cars or motorbikes. Instead, you'll find lots of tourists and locals, relaxing, walking, exercising, eating and playing around the lake. If you're lucky, you'll catch some free live music, too. We spent a Sunday evening walking around the lake, enjoying the city lights and quiet streets. West Lake is northwest of the Old Quarter area, but only by a 15-minute drive. For our last night in Hanoi, we decided to treat ourselves and stay in an adorable boutique guesthouse (Millan Home — check it out here!) for the evening. It was right on the lake, so we spent a relaxing afternoon exploring the surrounding area. The area around the lake is full of quaint restaurants, cafés, parks, and gardens. The lake also features several beautiful pagodas and temples. 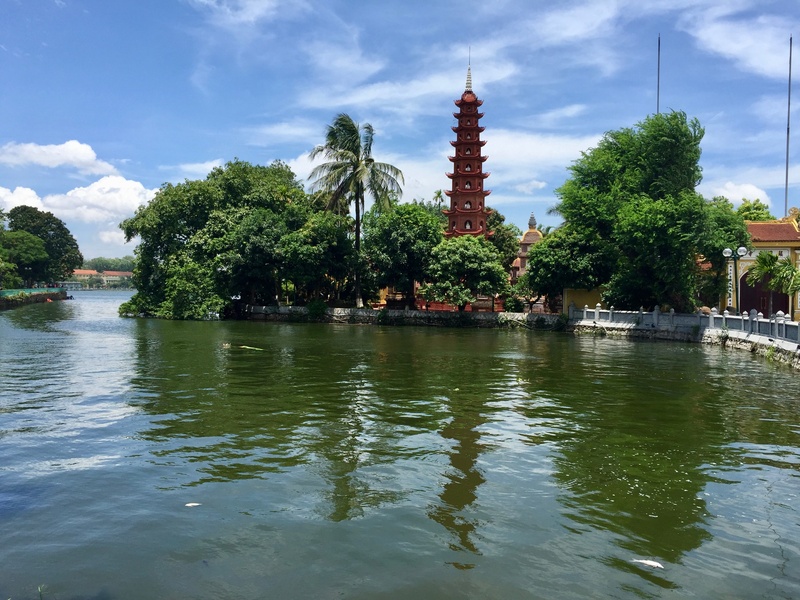 The first, Tran Quoc Pagoda (pictured above), is one of the oldest pagodas in Vietnam, and is built on a little "island" in the middle of the lake. It features a beautiful one-pillar pagoda that towers over the regal gates. The second, Quan Thanh Temple, is a Taoist temple built during the Ly Dynasty (1010-1225) to honor the Gods of the North. Both places are easy to walk to along the lake. Vietnamese food is renowned around the world for good reason. Almost everyone has heard of "phở," the famous noodle soup dish that you can get almost anywhere nowadays. While I hate to admit we actually never got a bowl of the infamous phở while we were in Vietnam, we had a taste of many other authentic dishes. All of them were delicious and fresh. 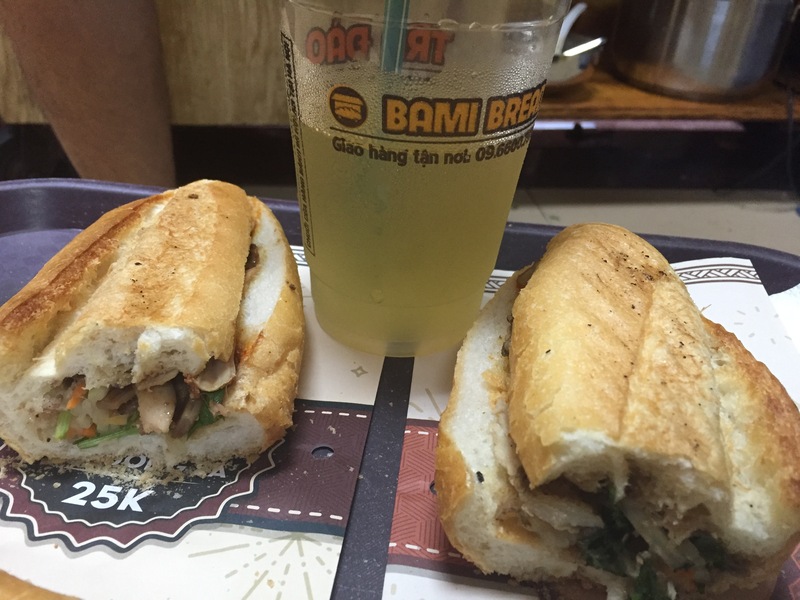 What is banh mi, you ask? The basic ingredients include a toasted baguette, sliced length-wise, spread with pate and mayonnaise, and topped with pickled carrots, daikon, cucumbers and fresh cilantro. The meat inside varies, but the most popular choices are slow-roasted pulled pork or thinly-sliced chicken. You can even order a breakfast banh mi with egg, or just opt for a veggie option. The possibilities are endless, and it's the perfect light meal to take on the road. I had never heard of this dish before coming to Vietnam, but it was one of the first dishes we tried, and we weren't disappointed. Banh xeo literally translates to "sizzling pancake" because of the way its cooked. Picture it like a savory crepe— it's made with rice powder that turns golden yellow because of the turmeric spices that are used to make it. Similar to banh mi, the ingredients stuffed inside the "sizzling pancake" vary, but typically include shrimp, pork, green onions, and bean sprouts. This is what we tried. Along with the banh xeo, we were given a heaping plate of raw vegetables and herbs, along with a plate of thin rice paper. 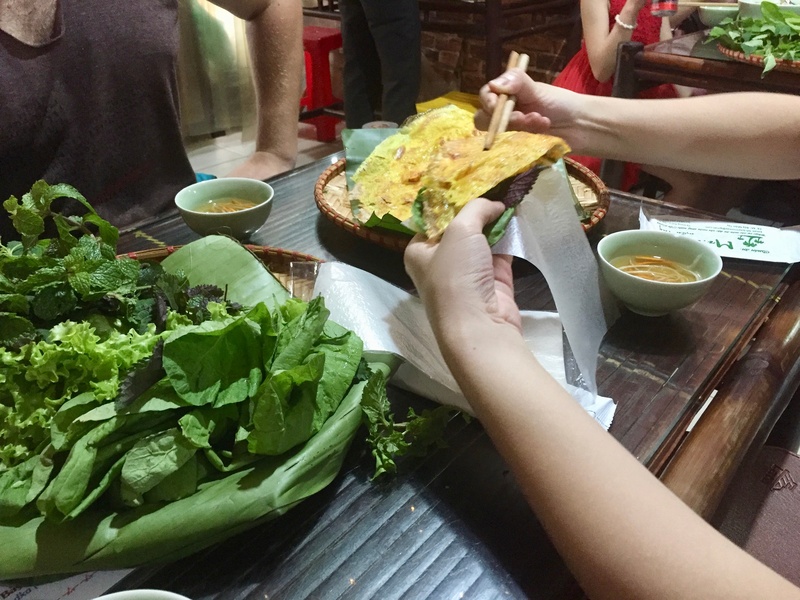 We learned to take a thin strip of the banh xeo, place it on the rice paper with our vegetables and herbs of choice, and then roll the rice paper to make a thin wrap. When we ate it, we were under the impression the banh xeo was solely made from egg. The crispness from the lettuce paired with the banh xeo, along with the crunchy rice paper on the outside provided many flavors and textures. We loved how we could spice it to our liking— dipping it in hot chili sauce, or filling it with freshly diced garlic. This is definitely a must-try dish. As always, try it before you spice it. When Obama visited Hanoi in 2016, he visited a small, family-run restaurant in downtown Hanoi, per Anthony Bourdain's recommendation. Obama and Bourdain sat on the second-floor of the restaurant on small, plastic stools (like everyone does in the city) enjoying a steaming bowl of bun cha, a deep-fried spring roll, and a cold Hanoi beer. Since his visit, the restaurant has become a tourist hot spot, not only because of Obama, but because of their incredibly delicious bun cha. We had to check it out, and we were so glad we did. We opted for the "Obama Bun Cha Set," an exact replica of everything Obama ordered. For a whopping $3, we were given a hot bowl of bun cha (grilled, fatty pork served in a sweet and sour garlic broth), a heaping plate of thin rice noodles (to add to our bun cha as we liked), another plate of fresh herbs and raw vegetables (again, to add flavor and texture to the soup as we liked), a massive crispy shrimp and pork spring roll, and, of course, a refreshing Hanoi beer. Like most Vietnamese dishes, the unique blend of flavors had us devouring our dishes in no time— from the salty, sour broth, to the sweet marinated pork and the thin noodles. It was one of the best meals we had during our trip. 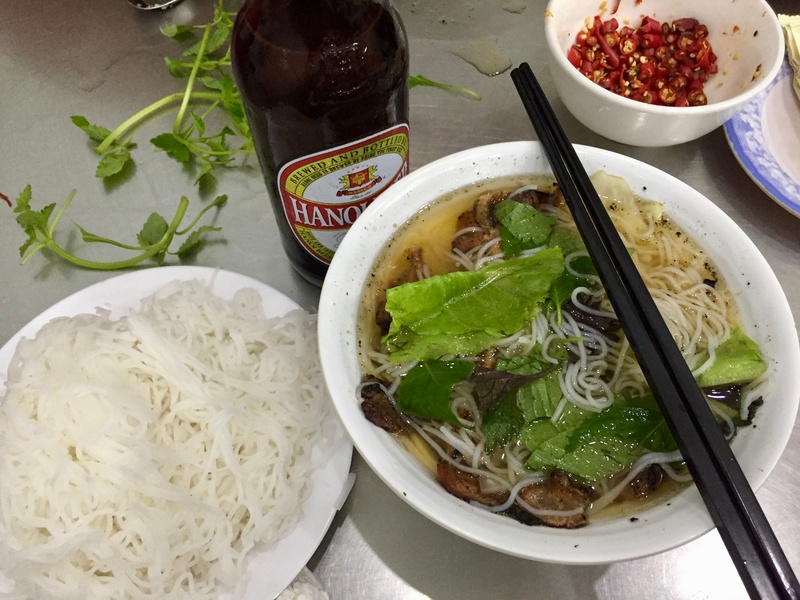 Despite these wonderful sites and delicious foods, my favorite moments in Hanoi didn't take place at a tourist site or a must-try restaurant. Rather, like the life here, my favorite moments took place simply wandering the streets. Watching women in straw hats carry fragrant flowers on the back of their bicycles. Listening to the horns of motorbikes as they weaved and zoomed through intersections. Sitting on a plastic stool sipping a cold local beer. Smelling freshly baked baguettes from the bakery next door. Hearing the soft tap of the butchers' knife cutting raw meat on a wooden board. 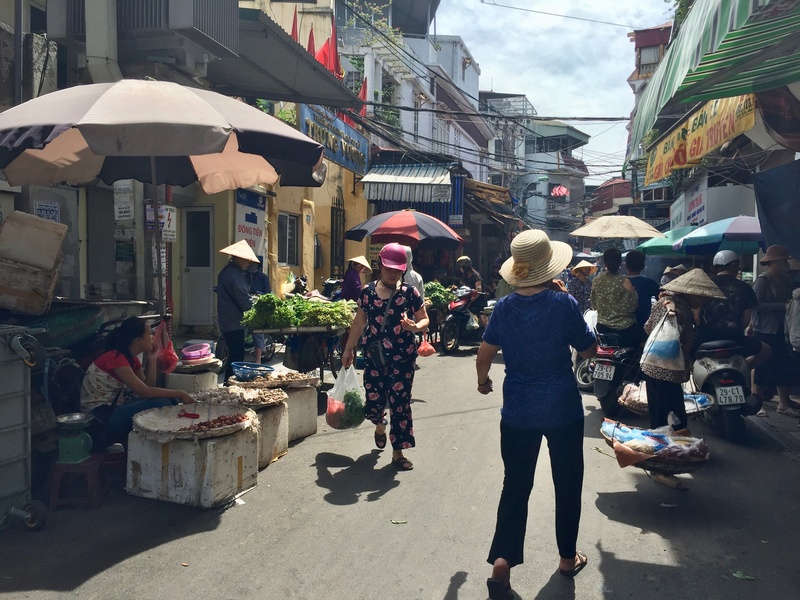 In Vietnam, doors are always open— to shops, to homes, to businesses— all day, every day. People work, eat, bathe, shop, get haircuts, and play on the street. Life here happens on the street.